The sunglass version of the blues glasses are most often used by our customers who are trying to create Jake and Elroy from the "Blues Brothers". 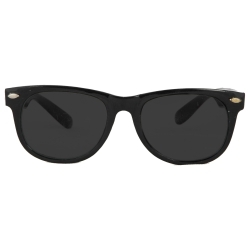 They can also be used for Men in Black, CIA, Secret Service, body guards, or any other character who needs dark glasses. The clear version of the blues glasses can be used for characters such as Buddy Holly, nerds, or hipsters. The blues brothers glasses have black frames and are available in clear or smoked lenses.